The NBA draft took place Thursday night, and the first two picks went off as expected. 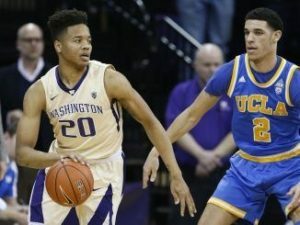 The Philadelphia 76ers chose Washington’s Markelle Fultz with the #1 pick, the Los Angeles Lakers grabbed UCLA’s Lonzo Ball with pick #2, and the Boston Celtics selected Duke’s Jayson Tatum at number 3. With Phoenix taking Kansas’ Josh Jackson and the Sacramento Kings picking up Kentucky’s De’Aaron Fox at #4 and #5 respectively, the 2017 draft marked the first time in NBA history the top 5 spots went to college freshmen. For the rest of the draft, click here. The big trade of the day went to the Minnesota Timberwolves who landed Jimmy Butler from the Chicago Bulls and a #16 pick in exchange for Kris Dunn, Zach LaVine and a #7 pick.